As the DACA debate rages in the U.S., which is the greater public complaint with immigration? A) The flooding of Europe with millions of undocumented refugees, a southern U.S. border as porous as cheesecloth or the thousands of refugees wandering across the Quebec/ Manitoba border this summer? Or B) The smug assumptions made long ago by the political and media establishment that created these crises and deceptions? A) produces an immediate reaction in the public. But B) is increasingly the complaint of a population that repeatedly told its elites in polling that it does not want unmanageable numbers of immigrants changing the values of its nation. Yet here we are, with precisely the economic and cultural chaos dreaded by the resident populations in those polls: Cultural dislocation and economic uncertainty in a community that fails to integrate. Persistent criminal or even terrorist threats from a percentage of the immigrants. A media/ culture barrage labelling anyone who doesn’t think Diversity is swell as a racist or Nazi. Policies that blame the resident population for not abandoning its culture fast enough. Only an unbridled optimist could look at the results of the past decade and see successful policy. As opposed to many of his cynical colleagues in Europe and the U.S., Justin Trudeau actually seems to believe what he’s selling about everyone living in harmony like Canada was a big Food Court. Pushback is everywhere. In Britain a highly permeable border has, in part, spurred the Brexit movement. In the rest of Europe, the resurgence of far-right political ghosts of the 20th century is altering elections. In the United States, the passive political resistance to 11 million illegal aliens gaining a foothold in America was a key agent of Donald Trump’s shocking election as president. 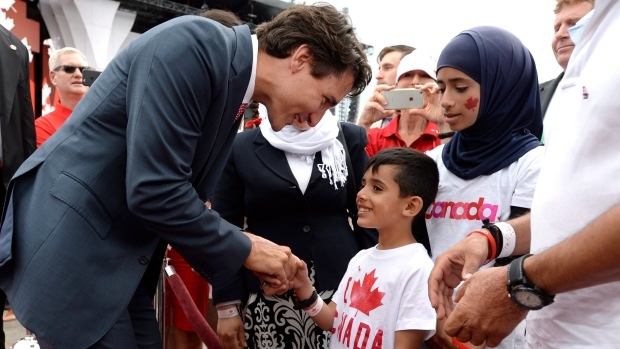 In Canada, the forces of immigration are bearded by the sunny visage of M. Trudeau, whose boundless optimism for acquiring new cultures— and scolding the resident populations for their luddite resistance— is lapped up by the media and the progressive SJW cadre. Yet the mainstream population is nervous with newcomers who won’t join the culture and are frustrated with officials who misled them. As Douglas Murray writes in The Strange Death Of Europe: Immigration, Identity, Islam, the people who initiated these policies drastically under-reported the numbers to be admitted, distorted the reality when it finally got too big to ignore and then issued a collective “It’s too late now” in response to complaints. Those who complained were vilified in the liberal press. But anyone living in southern Ontario will tell you that, outside a few minor exceptions, the immigrants who’ve come to that area remain in ethnic ghettos, declining to learn English or interact with the extant culture. Large swaths of Richmond Hill, Scarborough, Thornhill, Vaughan, Brampton and Mississauga are as removed from Canada as if they lived in another land. There is no pressure from the political or media class to assimilate. It’s the same in other major Canadian urban centres. Faced with evidence of that his policies don’t work, Trudeau becomes a major apostle of the “what can we do anyhow?” school about immigration. His solution is not for newcomers to change but for Canadians to change to accommodate the people Trudeau wants to admit. This line of reasoning says that Canadian have always been an immigrant culture, and what’s different now? Besides, what about the guilt of the people who settled Canada? What Trudeau and other priests of the immigration church neglect to mention is that the people who came to Canada (and the U.S.) in previous immigration waves came for the values that were here. They wanted to assimilate into a liberal democratic tradition that valued property rights and equal acceptance before the law. They weren’t coming to simply rent a stall in the market. That has changed. It’s now considered evolution to be overwhelmed in your own culture. The current newcomers— who’ve fled some of the worst spots in the world— have been told that Canada won’t impose its values on you. So go on being whatever you were at home. But nations such as Japan, which Douglas Murray points out could offer a promising economic future to immigrants, have almost no immigration because they foremost want to protect their culture. In Europe, the former Soviet bloc nations such as Poland, Hungary, Slovakia and Bulgaria have said no so far to the immigrant tidal wave created by German prime minister Angela Merkel’s unconditional invitation to find safety in Europe. Again, their desire to perpetuate the cultural elements of their national histories overwhelms Merkel’s tender sensibilities. But Canada and other Western nations seem to have given up on the national projects of identity. The virtue signalling of white liberal guilt— represented by refugee immigration— has pushed aside history. As long as appearing compassionate is the goal, all other questions are ignored. Such as, how many refugees is enough? Having taken in millions in the West since the Syrian Civil War started, there still remain an estimated 50- 70 million refugees in the world. What happens to them? Do Canada, the U.S. and Europe have an obligation to them, too? These questions are never addressed. Responsibility for past lies is dodged. Besotted by the magazine covers and TV interviews, Trudeau has no answers. We have entered post-Canada. A land where the past has been jettisoned and the public told they need to get on with the plan. Where the same people who make a fetish of promoting indigenous culture think nothing of obliterating the taxpayers’ culture. If Europe is any indication, it will not end well.